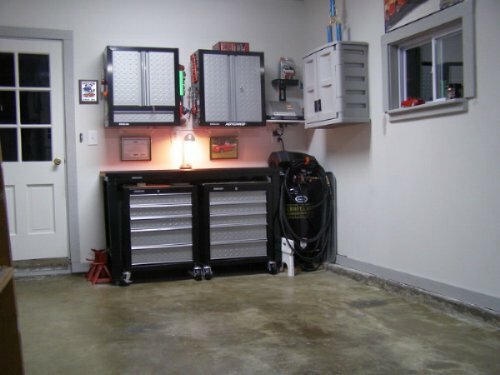 Garage cabinets are great for keeping a variety of items secure, out of sight, and away from dust. If you keep on the lookout, you can often find old cabinets at garage sales. Even if they're beat up a little bit, they'll make great storage cabinets in your garage. A little primer and paint, and they're good to go. Another way to find cabinets, as well as garage storage and organization bins, is to use Craig's List . In fact, using Craig's List is a great way to find all kinds of useful stuff for your garage. You can also purchase different types of cabinets at your local home improvement center. You'll definitely pay more for these then you would if they were from a garage sale. As you can see from the picture above, store bought cabinets will give you the cleanest, sharpest look and feel without a whole lot of elbow grease. In addition to the practical value they provide, they really make a dramatic difference in the overall look and feel of any home garage. They're available in wood, metal, or plastic, as well as a variety of shapes, sizes and colors. Store bought cabinets typically come in a box, then it's up to you to get them assembled. Some models, however, require very little or no assembly at all.